Here we are, in the dog days of summer. You deserve to kick back and be lazy. These are the days you are refueling and recharging your artistic batteries. I have to thank Cameron Taylor Brown for a mind blowing lecture and workshop. A few of us thought the workshop would be just about printing a photo on an inkjet printer. Cameron showed us a new way to manipulate materials. Her PowerPoint presentation had two purposes. One: she showed us how to pull images from trips and make them into pieces of art. The second: how to train ourselves to see design elements at home. We don’t always see things with a fresh eye. Yes, there are design elements at home. We don’t have to go across the world. But we do need to train ourselves to see the juxtaposition of these elements. Traveling does help us develop the artistic vision mainly because everything is new. But we don’t have to go across the world to be successful artists. Through Cameron’s slide show, we took a trip with her through the Himalayan Kingdom of Bhutan, Peru, and Gujarat, India. She showed us how her photographs inspired her artwork. One of Cameron’s methods is to use silk organa and cotton sheets prepared for the inkjet printer by Jacquard. She layers two identical sheets over each other to create a shimmering image, almost like a hologram, but more subtle. We added other design elements, threads, fabrics etc. and came home with new tools for our creative expression. I hope our members bring their finished workshop pieces to our October show and tell meeting. Yes, there are second chances! If you have not finished or even started your "Branching Out" Challenge there is still time. Do it! Bring it to our October meeting. Check out Smadar’s email with the specifications. When your piece is photo ready, send me a jpeg image celestearc@gmail.com so we can load our challenges onto our website. Our website will be a preview for our Branching Out show at the Branch Gallery. Our next meeting will be at Rosemary’s Atelier de Paris. 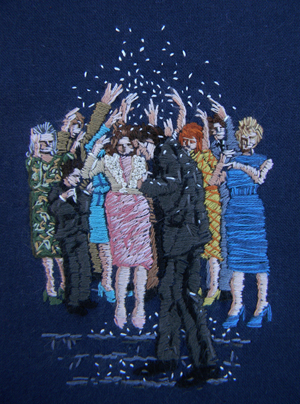 Our Morning lecture will be presented by Michelle Kingdom (Embroidery Artist). My work explores psychological landscapes, illuminating thoughts left unspoken. 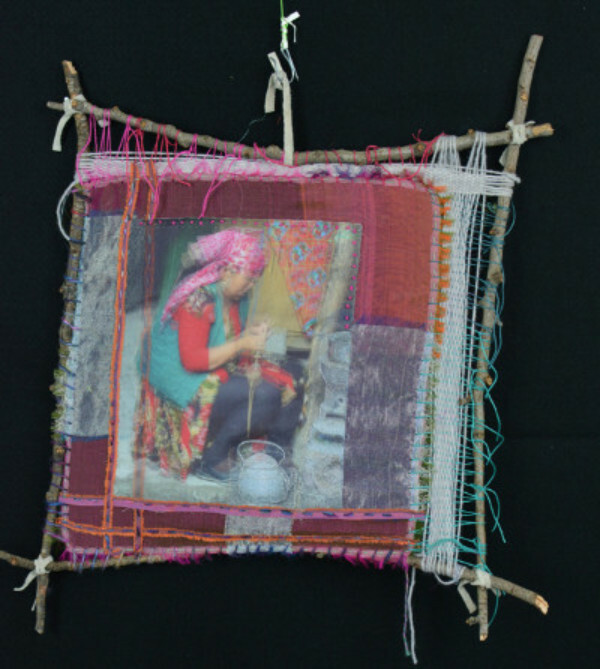 I create tiny worlds in thread to capture elusive yet persistent inner voices. Literary snippets, memories, personal mythologies, and art historical references inform the imagery; fused together, these influences explore relationships, domesticity and self-perception. Symbolism and allegory lay bare dynamics of aspiration and limitation, expectation and loss, belonging and alienation, truth and illusion. Our afternoon will be a workshop by our own member Barbara Weitekamp. I am already excited about it. She will show us a new technique for transferring images using your inkjet printer. We have all heard in the past that we needed a laser printer to do this, but Barbara will show us how she does it with the same inkjet printer you have at home. Sign up for this workshop; it will be fun and informative. Born and raised in Los Angeles, Michelle Kingdom studied drawing and painting in college, earning a BA degree in fine art from UCLA in 1990. She has been involved in various fields of art and design throughout her career, including fashion design and art education. 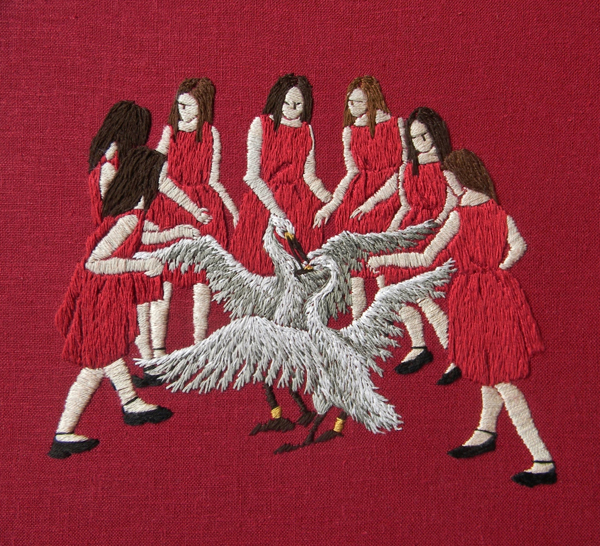 As a self-taught embroidery artist, Michelle has been quietly creating figurative narratives in thread for years. 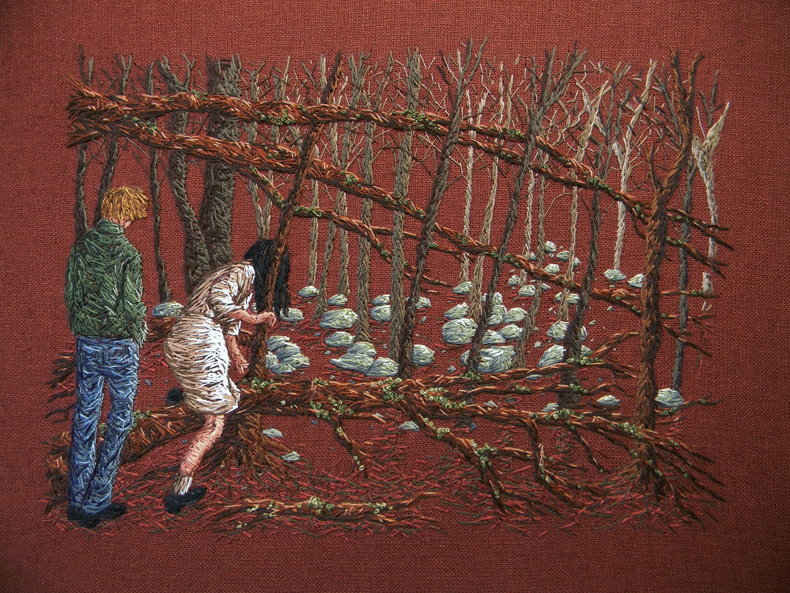 Now she exhibits her work internationally, and her embroideries are held in private collections. When not busy stitching, Michelle teaches children and lives in Burbank, CA with her husband and daughter. "They could feel themselves shining in the dark"
"What is done cannot be undone"
This afternoon workshop is a wonderful follow-up technique to our last program with Cameron Taylor-Brown. 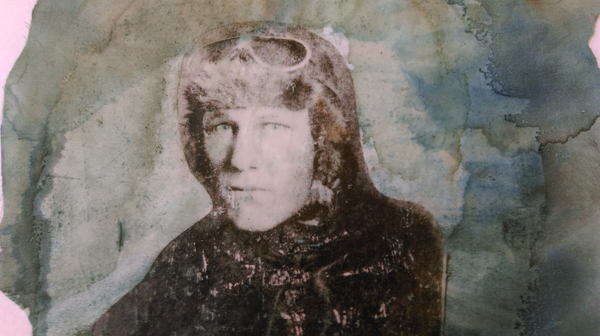 Learn to transfer your favorite images and photos onto fabric, paper or interfacing using an inkjet transparency and gel medium. I will provide participants with preprinted images on a transparency but will fully explain the process so that you can continue experimentation at home. You can do this technique on a standard inkjet printer. 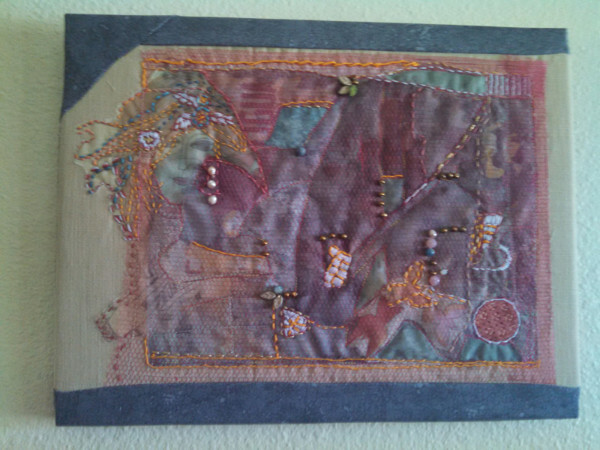 This is a wonderful technique to use in quilt art and collage. Time permitting we will experiment with other transfer mediums such as water and wax paper. Preprinted overhead transparencies, gel medium and some fabrics. Fabric- small sizes around 8X11. Can be hand dyed, painted, light colors best in a tightly woven cotton, polyester or sheers – in other words, practically anything! Experiment! Paper-card stock weight and papers that will hold up to liquids. This is another in our member provided programs. Recently, Hand Weavers' Guild extended an offer to SAA to join their Allaint umbrella liability insurance policy which covers 4 guilds and splits the costs and liability between each..
Alliant Insurance has informed us that the underwriter will not extend liability to SAA because ; 1. we are an Association, not a Guild , and 2. the underwriter does not feel that we have enough in common with hand weavers. The SAA Board will continue to evaluate the need for liability insurance, and to look at the various companies that cover social groups. We hope to find coverage for around $400 to $600 per year. By a majority vote, the Board has approved the purchase of a PC/MAC compatible digital projector, the cost not to exceed $500. This purchase will make it easier to recruit speakers and to provide workshops. President, Celeste Covas will explore and purchase. We are hoping that by Feb.2017 we can find a new meeting / workshop location. Rosemary Cohen has been most generous in permitting us to use her location for meetings during our search. We hope to find a location that has easy, handicapped friendly access, and available parking. Please contact Celeste or Mary Beth if you know of a suitable location. Many of you belong to other organizations that meet regularly and might know of a place. Meanwhile our plans are that the August meeting will be at Rosemary’s; October we are thinking about a field trip; and December is the Holiday Party, to be held once again at at Meredith's house. We have revised the requirements of our Challenge in order to broaden our member's participation. Please review the requirements below. All images are due to Celeste by October 1, 2016. There is a $30 entry fee, which can be paid through the website. 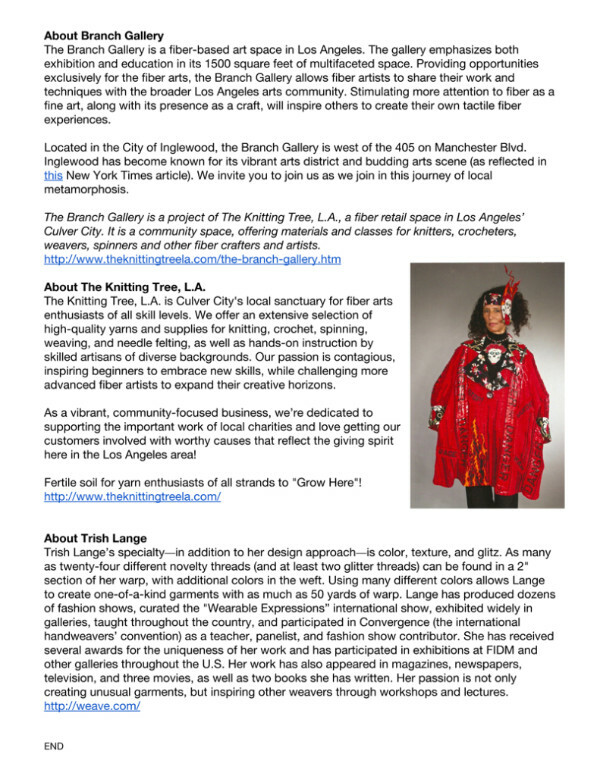 “Branching Out” at the GRAND OPENING of the Branch Gallery and The Knitting Tree in November. 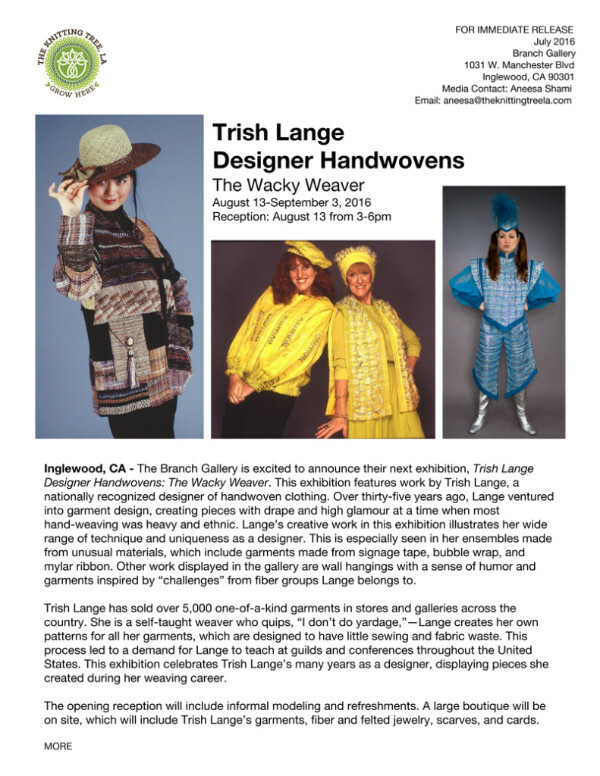 The Branch Gallery will be having their Grand Opening in Nov. as The Knitting Tree yarn store will be moving to their new location next door. We will be showing our “Branching Out” challenge at that time. You still have time to work on your challenge. It is not too late to finish or start working on your piece. Please see below for the CHALLENGE specs. The challenge is due at the October 1st, 2016. 2. Provide additional information as needed for the proposals, including individual artist biographies, high resolution photographs of your submission(s). We hope this will challenge your imagination and tap your creativity and you’ll create a masterpiece for our upcoming exhibition. We look forward to seeing your new work. This is the most helpful step by step link I found to writing your ARTIST STATEMENT, below is the information found on this link. #1 - Be honest with yourself. Before you write a word, take some time to just think about you and your art. You need to understand what it is that you are trying to achieve, before you attempt to explain it to anyone else. Ask yourself what you're doing. What does your art express? What makes your art unique? Ask yourself why you're doing it. What motivates you to create art? What emotions or ideas are you trying to convey? What does your art mean to you? Ask yourself how you're doing it. What do you draw inspiration from? What tools and materials do you use? #2 - Consider your influences. Think about the things that influence you, whether it's art, music, literature, history, politics or the environment. Think about how these influences have made an impression on you and how they manifest themselves in your work. Try to be as specific as possible. #3 - Make a mind-map. Mind-mapping is a good way to free your thinking. It will also help you to trace the relationship between different ideas. Jot down a key idea that informs your work in the center of a blank page. Then spend 15 minutes writing down any words, phrases, feelings, techniques etc. related to that idea. Free writing is another technique that can help get the creative juices going. Spend 5-10 minutes writing whatever pops into your head when you think about your art. You'll be amazed at what you come up with. Make a statement about why you do what you do. The first section of your artist's statement should begin with a discussion of why you make art. Try to make it as personal as possible. Talk about what your goals are and what you hope to achieve through your art. Determine what you want people to understand. Think about what you want people to take away from your art. What message or emotion are you trying to convey? #4 - Keep it short, sweet, and to the point. Your artist statement is an introduction to your work, not an in-depth analysis of it. Your artist’s statement should be one to two paragraphs and no longer than a page. Your statement should answer the most commonly asked questions about your art, not overwhelm readers with irrelevant facts and minute details. Brevity and efficiency of language are key. A good statement will leave your readers wanting more. #5 - Use simple language. An effective artist's statement reaches out and welcomes people to your art, no matter how little or how much they know about art to begin with; it never excludes. It should make your work more accessible, not obscure it with convoluted language filled with artsy jargon. Write in simple, straightforward, everyday language. Make "I" statements rather than "you" statements. Talk about what your art does for you, not what it's supposed to do for the viewers. As an artist, I work hard to develop paintings that speak both to me and to others about the beauty that exists in the ruins of ancient societies. Part of my process before I begin painting is to read as much as I can about the specific set of ruins I am about to recreate on canvas. I do not merely want to capture the image with my brushes; rather, with careful, colorful strokes, I want to give that society life once more. I try with every finished work to breathe life into a long forgotten culture so that its designs, ideas, innovations, and lifestyle are displayed on my canvas. The challenge, as with any recreated moment from the past, is to not caricature the moment and instead capture it in all its former glory. My artwork speaks, not only for me, but for people who were long ago silenced. Artwork created in Cameron Taylor Brown's workshop. Sandra Sigal's artwork is a piece started in Cameron Taylor Brown's workshop. She is a Kirgye woman spinning from Bhutan. Cameron provided the photograph.